Picture this: You’re settling in for a cross-country flight, and you order your favorite drink to enjoy while you fly. But when you take that first sip, it doesn’t quite taste like it usually does. That’s because air travel changes your body chemistry—meaning certain salty or sweet flavors won’t stack up to their equivalents on the ground. There are a number of factors that affect the way food and drink on airplanes tastes, as well as some tricks to keep those flavors exactly the way you like them. Airplane food is fundamentally different from the food you eat on the ground. 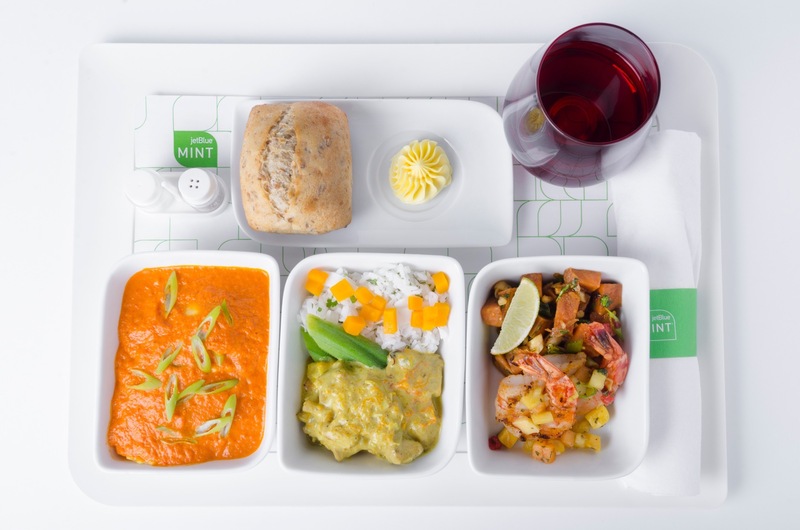 The inflight culinary experts who work on the ground specifically select food and drink based on the scientific changes your body undergoes during a flight and the way altitude and pressure affects certain ingredients. The airline’s kitchen partners prepare the food in advance of travel, and JetBlue’s inflight crewmembers reheat any meals served hot using ovens aboard the aircraft. You probably understand that if you’re on an airplane traveling 500 miles per hour, you’re also moving at 500 miles per hour. What you might not realize is that like the air inside the plane, your body is also pressurized. This directly affects your senses. You can’t taste sweetness or saltiness nearly as well on an airplane due to altitude and pressure, as well as a lack of humidity. Cabin air also decreases your ability to smell, and tasting is as much about your nasal passages as it is your taste buds. Even the noise that jet engines produce can impact your tongue. Just as alcohol affects you differently in the sky, it tastes different, too. This is particularly noticeable with wines, which tend to taste more acidic and tannic inside the pressurized environment of an airplane. In theory, this should be good news for those who tend to avoid sweeter wines, but it’s somewhat of a roulette game given the tasting discrepancy that flying creates. Try out Mint tapas plates that include tomatoes, mushrooms and seafood. Flying enhances their umami, or savory qualities. Or stick to packaged foods like chips and cookies—their preservatives prevent in-air changes. As for wine, experts recommend that you drink it near the start of the flight before the lack of humidity really affects you. Regardless of what you order, make sure to stay well-hydrated to prevent your taste buds from drying out.